It looks like the Internet beat Gran Turismo 6 to the punch. 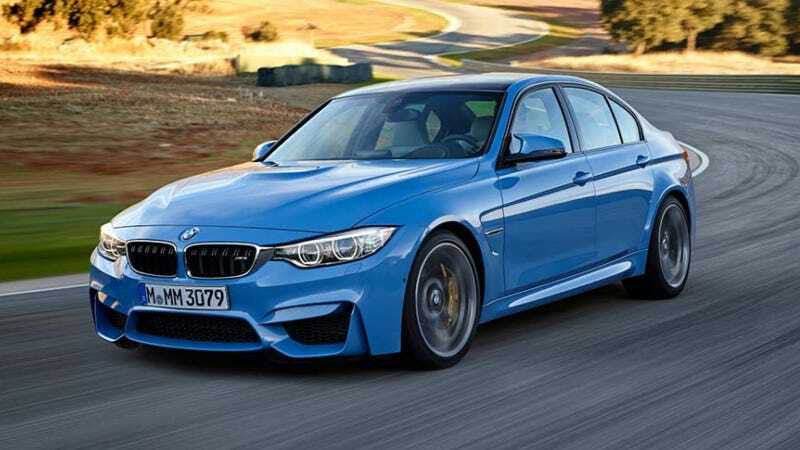 Meet the next generation of BMW's M cars: the 2014 M3 and M4. There's two of them now! Will The BMW M4 Be Unveiled In Gran Turismo 6 On Thursday? The first official press photos showed up this morning on German Car Scene and BMW Blog, although the latter's posts on the cars appear to have since been taken down. At any rate, the pics are out, along with details on the cars. The M4 isn't too much of a surprise. It's pretty much in line with the M4 Concept that made its debut back at Pebble Beach. But the M3 sedan, which cribs a lot of styling cues from its coupe brother, is new. I have to say both of them look pretty good. They have show, but can they go? German Car Scene reports both cars, as predicted, use a twin-turbo 3.0-liter inline six engine rated at 430 horsepower, about a 15 horsepower bump over the old M3's V8. Power goes to the rear wheels (duh) via either a six-speed manual (yay!) or a seven-speed dual clutch transmission (also good!). They say weight-saving measures like a carbon fiber roof and an all-aluminum hood help keep the cars under a respectable 3,300 pounds. That power-to-weight combo is enough to send both cars from zero to 60 mph in under 4.5 seconds. Expect more official details to be released today on Gran Turismo 6 or some other form.